One of the beautiful things about CBD is the wide variety of ways to consume it. We know that sublingual tinctures are a consistent and effective delivery method, but what if you want to change up your routine? 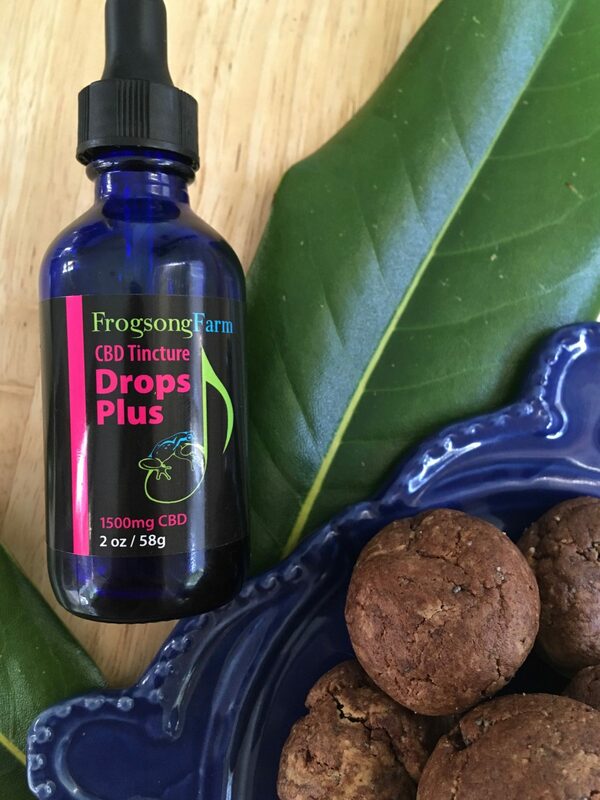 Know someone who wants to use CBD oil but doesn’t care for the taste or experience of a CBD tincture? High quality CBD oil can be added to countless foods and beverages. When choosing a recipe to use, look for gentle temperatures 350 degrees or below (for recipes that include cooking/baking), and oils or fats with which to disperse your CBD oil. Consuming your CBD with healthy fats aids in absorption. 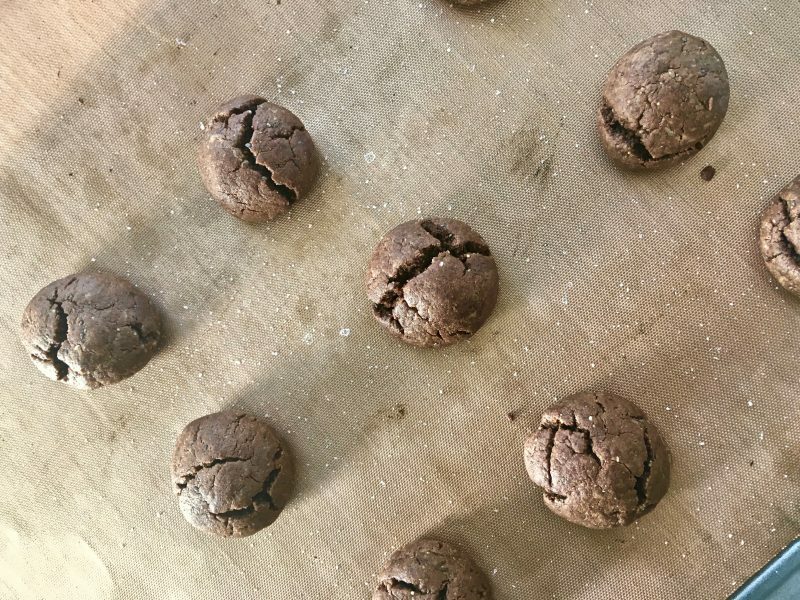 Here’s a simple cookie recipe made from whole foods you can feel good about. This recipe is gluten free, grain free, dairy free, refined-sugar free, and delicious. These have a texture like a chewy brownie, and the CBD flavor is virtually undetectable. Chocolate and peanut butter are rich in plant oils just waiting to blend with CBD and tantalize your taste buds. Chia seeds and sea salt offer a slight crunch, which contrasts with the soft, fudgy interiors. Add any mix-ins you like. Bring these (clearly labeled) to your next potluck or bag up a batch as a gift for your favorite CBD-using friend. 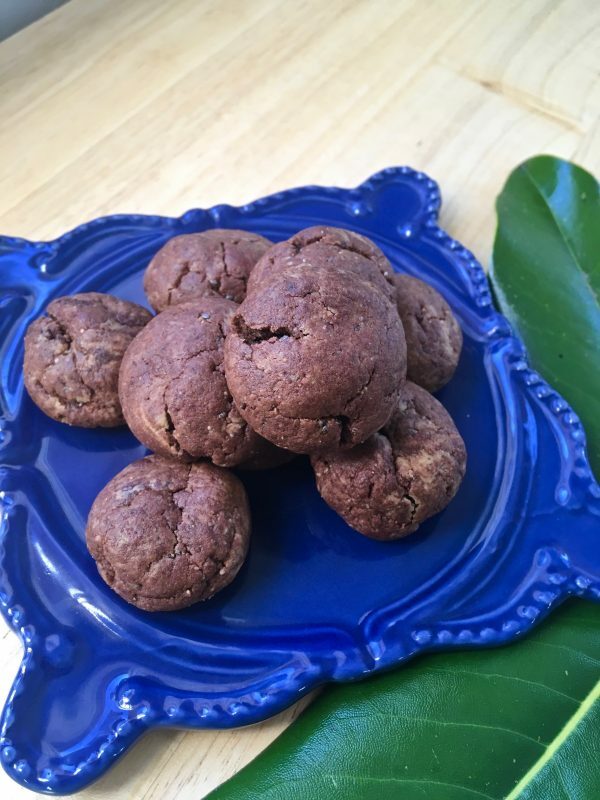 These are lightly, naturally sweetened and full of good fats and fiber, so let go of the guilt and enjoy them any time of day! -Be sure to clearly label all foods that are medicated with CBD. It’s an all around bad idea to dose an unsuspecting or nonconsenting friend/ family member/ stranger with CBD. 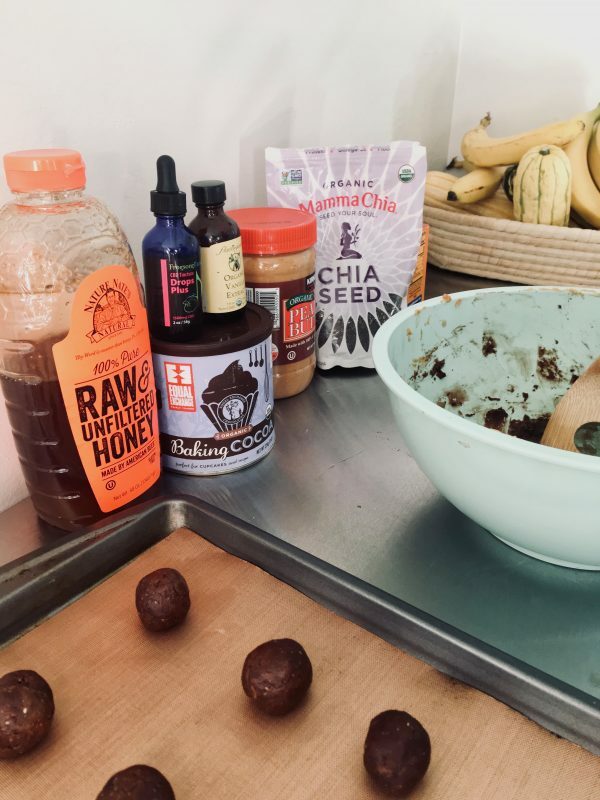 -Whisk the CBD oil into the egg before adding other ingredients. Mix well to ensure even distribution. -These cookies barely spread. Feel free to flatten slightly before baking for a flatter cookie. 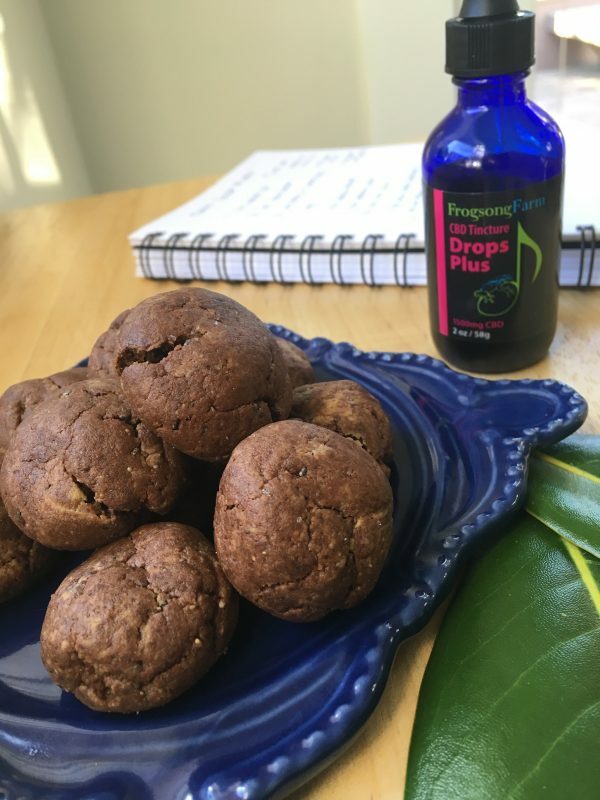 -This 100 mg CBD recipe is designed to make 20 very small cookies with 5 mg CBD each. Make any size cookies you like- just be sure to count them before you start snacking so you can calculate dosage. For example, 10 cookies will contain 10 mg CBD each. -Feel free to trade out the peanut butter for almond butter or your nut butter of choice. Whisk CBD oil into egg until thoroughly blended. Add remaining ingredients and mix with an electric mixer or wooden spoon. Roll into 1-inch balls and place on parchment-lined baking sheet. Bake at 350 for 7 minutes or until just beginning to set. Allow to cool (or don’t). Enjoy! Be sure to clearly label all foods containing CBD. Will keep 2 days at room temperature or freeze for 1 month. Need to restock your CBD oil? Visit our web store here and keep your supply from running dry. PS: Did you know we partner with local companies making gourmet tasty treats with our CBD? Our friends at Soma Kombucha carry CBD kombucha and CBD water loaded with our full-spectrum water-soluble CBD, and our friends at Aviv offer a dreamy CBD ice cream that happens to be vegan and naturally sweetened. Happy snacking and be well! 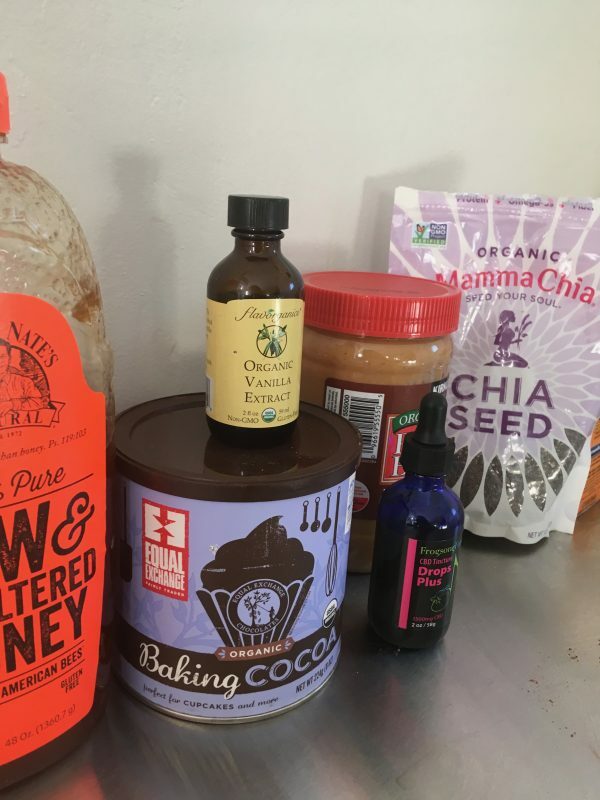 This entry was posted in Education, Partnerships, Products, Recipes and tagged b corp company, baking with CBD, CBD chocolate, CBD cookies, CBD edible, CBD oil, CBD peanut butter, CBD recipes, cooking with CBD, dropsplus tincture, frogsong farm, full spectrum, healthy CBD desserts, healthy CBD recipes, Healthy eating, hemp extract, homemade, how to use, organically grown, sustainable. The 350 degrees does not ruin the medicinal benefits of the CBD? I’ve always wondered how to incorporate CBD into food but was afraid to bake or heat it past the decarb temp. Thanks for your product and for helping to educate the masses! Hi Brenda! Thanks for your question. Most of the literature we’ve seen says that CBD stays perfectly stable and viable at love baking temps. Above 350, some terpenes can be lost, as they’re quite volatile, so that’s one consideration. These are complimentary aromatic compounds, not the actual CBD. We wouldn’t recommend using CBD oil at higher cooking temps or for sautéing/frying. Gentle baking has had good results for us, as well as mixing into warm soups, melted chocolate, etc. 🙂 Hope this helps. I have been so anxious-positive and negatively…until reading your full site. I feel more at ease and will be placing my 1st order quite soon. Your site has helped me let go of the “pot guilt” and overdose scare. No exaggeration-I have tears. I cannot live, bear or tolerate my pain, anxiety, PTSD, depression…did I say PAIN…any longer. Then I came to a cookie recipe!!! I’m very excited about your products. Thank you so much for popping out of the woodwork on the day I considered finding pain relief in pill form-in a less than legal purchase. I was on Hydrocodone for 3 years–coming off was ok, weaned slowly-been free of IT but not this ugly chronic pain, etc. Please let this be the end of pain induced anxiety, fatigue. sleepless nights….along with the anxiety PTSD depression CRPS Neuropathy… I already live with!!! Thx for inviting me in!! Looking fwd to baking too!